Rem Koolhaas wrote film scripts and news dispatches before he designed buildings, and when he attained fame as an architect he did it backwards: he hadn’t really built anything, but he’d written Delirious New York: A Retroactive Manifesto for Manhattan (1978), and that was plenty. Eventually he began building, but by then it was in a way too late. He was a (delirious) modernist at heart, dreaming of dizzying the skyscraper and the grid with the fever of surrealism, but the reactionary years of Thatcher and Reagan were upon him, and he had to act on their stage. He continued with architecture – his firm’s buildings include Beijing’s CCTV Tower (2008), Seattle’s Central Library (2004), and Porto’s Casa de Música (2005) – but he also struck on a method for shielding himself: he would supplement his practice with writing. The logic was twofold. Architecture, he explained, is a slow vocation. You have an idea and you build a building, only to find the world’s changed. To have any chance of keeping afloat you have to engage in agile and almost limitless research: not just in urbanism, but sociology, anthropology, politics, media, and all the other cultural ingredients that make up a zeitgeist or predict a future. From this imperative came AMO, the think-tank arm of Koolhaas’s architecture firm, OMA. The second strand of his literary turn was motivated by a stunted critical impulse. To carry the work of high modernism into the neoliberal era meant facing up to a debilitating irony. Your architecture, conceived with the intention of a tempered, twenty-first century avant-gardism, would soon be realized as a fully commodified monument: a splashy museum beckoning tourists, a vanity project for a dictatorial regime, a mixed-use housing project with no illusion of affordability, topped off with offices and a luxury hotel. Even if these practical problems were skirted, there would still be the issue of representation: what did all these virtuoso displays of spectacular lightness really signify, if not the free-floating fantasy of finance capital? Spectacle and lightness could be rebelled against, as Koolhaas frequently attempted, but any advancement of the sublime or oneiric in architectural history still seemed too easily absorbed by a triumphal capitalism, or smacked too much of a precious formalism. It became apparent that the only way to build and critique would be to build and then critique; Koolhaas has continued to pursue critical writing as a bid to stake out a semblance of independence in a profession awash in money. With the success of Delirious New York and a few buildings under their belt, AMO began releasing massive, thrillingly strange books: first S,M,L,XL (1995), then Project on the City (2002), a multivolume work undertaken alongside the Harvard School of Design, where Koolhaas teaches. S,M,L,XL surveys OMA’s architectural projects, presenting them alongside a literary panoply of diaries, travelogues, fairy tales, critical essays, fables, photos, and sketches; Project on the City led off with Great Leap Forward, a volume on the Chinese urban corridor fusing Hong Kong, Guangzhou, Shenzhen, and a host of other cities along the Pearl River Delta, and then turned out a second volume, The Harvard Design School Guide to Shopping, that examined consumer space at the paradoxical moment of the mall’s ubiquitous overhaul of urban and suburban space, on the one hand, and the first stirrings of its decline on the other, its growth eroded by online shopping and boutique-y urban renewal schemes. Enclosed in the Guide to Shopping was a stunning polemic, Junkspace, now reissued by the New York Review of Books and paired with a response by art critic Hal Foster. Junkspace falls into a tradition of left writing (Adorno’s Minima Moralia, Benjamin’s “One-Way Street,” Debord’s Society of the Spectacle) that gestures in and around its subject with fragmentary theses or jottings. 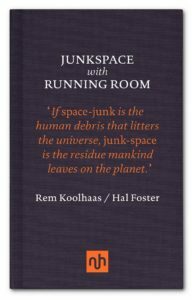 Like Debord’s Society of the Spectacle, Koolhaas’s Junkspace attempts to describe its subject and inhabit its rhythms mimetically, to produce a literary junkspace that mirrors the shiny cluttered hell of the contemporary built world. Junkspace appears to be a concept, but it’s not, really; it’s more a slogan, one meant to umbrella over every bit of architecture thrown up, torn down, remodeled and distended since the Thatcher/Reagan years, and like its subject it resists concision and reaches for tentacle-like elaboration. So far, so postmodern. But the true horror of junkspace is its relentless ironic turns, the way it is dialectical without being transcendent. One would think a riposte to the glimmer of Hollywood ornamentation might be minimalism, but Koolhaas argues minimalism, too, is guilty, merely the flipside of an unredeemable dialectic. “The ultimate ornament, a self-righteous crime, the contemporary Baroque,” minimalism cloaks junkspace but doesn’t replace it, or strives to disappear entirely into post-industrial lightness. Which is where Hal Foster comes in. Foster, whose books include The Return of the Real (1996), The Art-Architecture Complex (2013), and Bad New Days (2015), is today’s left’s most thoughtful, forward-looking, principled critic – something all the more remarkable for his frequent turns as a polemicist. If leftist art criticism were strung along a pole, on one side would be Foster, and on the other the provocateur and occasional Stalinist Boris Groys, with the convincingly provocative Claire Bishop somewhere in between, sliding towards Foster while citing Groys. Foster’s criticism is systemic yet flexible, self-doubting but suggestive; it progressively captures the mood of the present while working to turn it, to redirect its drift by repurposing its elements. He displays many of these qualities here, in an afterword seeking to open up a way forward for architecture titled, with a characteristic mix of modesty and ambition, Running Room. Running Room is at its best when it works with Koolhaas, extending and updating his argument. Sparks of insight flare out in short suggestive bursts. (Like Junkspace, Foster’s essay is scattered and fragmented, divided in titled sections.) Foster appends to Koolhaas’s totalizing sweep a quiet series of useful additions, questioning junkspace’s limits by invoking the recent growth of other spatial types: the camp, whether for migrants or prisoners, and various forms of state and commercial surveillance, redolent – Foster doesn’t quite go here – of the new “smart city” urbanist model, exemplified by New York’s High Line-adjacent Hudson Yards project. Where are the cracks, and how big? Foster’s hope for countering junkspace’s “fuzzy empire of blur” is to revive a sense of architectural autonomy: to figure out, amid all this bloat, a set of architectural principles that can advance architecture outside market demands. “At moments,” Foster writes, “nothing less than the survival of architecture is at stake for Koolhaas. How can architecture persist when the conditional is the norm, when ‘there is no form, only proliferation,’ and when spaces ‘search for function like hermit crabs looking for a vacant shell?’” Foster’s goal is to reground architectural practice, and by doing so to discover a “new kind of negative capability,” an ability to say no to commercial disorientation in favor of a basic sense of architectural clarity. And yet his hope seems both too marginal and too conservative. Disciplinary autonomy could imply a distanced criticality, a layer of insularity for a field increasingly transformed by related and overlapping sectors: fashion and design, digital technology, the somersaulting pace of commercial development. But could a program of architectural autonomy really flourish under present economic and political circumstances into anything other than niche academicism or defeated moralizing? And is there a way to imagine autonomy progressively, as something other than a return to modernist principles, “the recursive strategy of the neo” that Foster himself sees as “played out”? In their “unimaginable” scale these warehouses approach a new architectural sublime, unleashing hugeness and material presence on a scale far surpassing industrial modernism. They accumulate like cities in the desert and have little need for people, opening up, for the first time since the modernist era, to new industrial necessities, and returning to modernist concerns of need and function. These new industrial areas replace the directness of architecture’s social function with something more purely industrial: compounds for machines and occasional teams of tech workers, uninhabited and rarely visited, through which architecture and engineering can renew their march of historical progress. Architecture can reign in the country and leave the city as so much junkspace. If we wish for architectural autonomy, we might just get it. William Harris is a columnist for Full Stop who has also written for the Los Angeles Review of Books, 3:AM, and The Point. He lives in Minneapolis.